Pra Ta Gradan Nuea Chin Dtakua Pim Gaes Yaw - Classic member of the 'Trai Pakee' (Top 3) Category of Leaden Hiding Place Amulets. 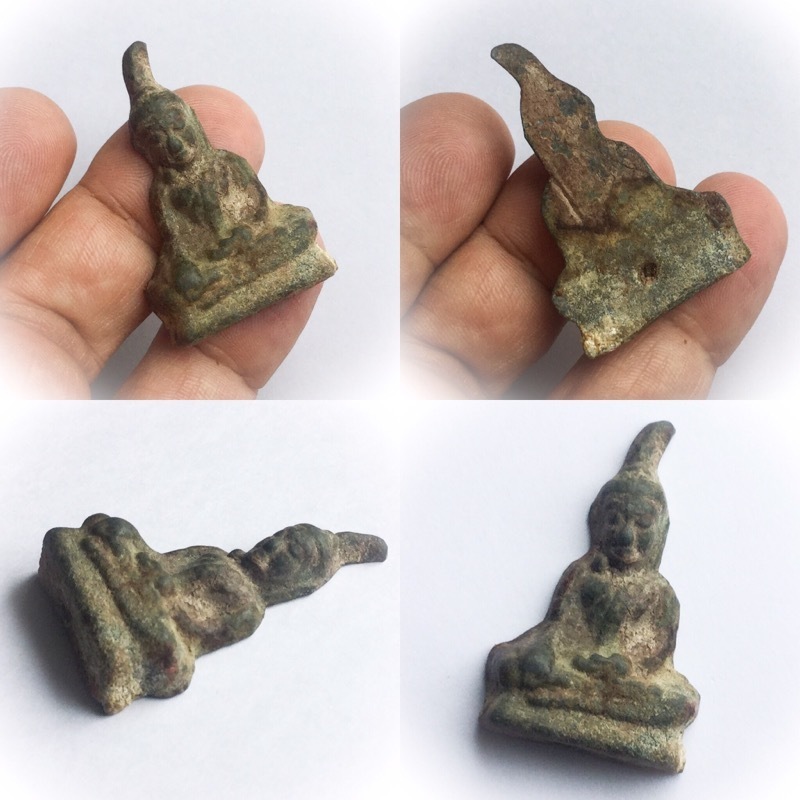 The Pra Ta Gradan is a Pra Kru hiding place archeological dig amulet from Wat Klang, Wat Nuea and Wat Tai temples of the Kanjanaburi Region. Made from Nuea Chin (leaden alloys). It is assumed to have been created in the U-Tong Era, and not thought to have been created by Buddhist Monks, rather is believed to be created by the Ruesi (Lersi). 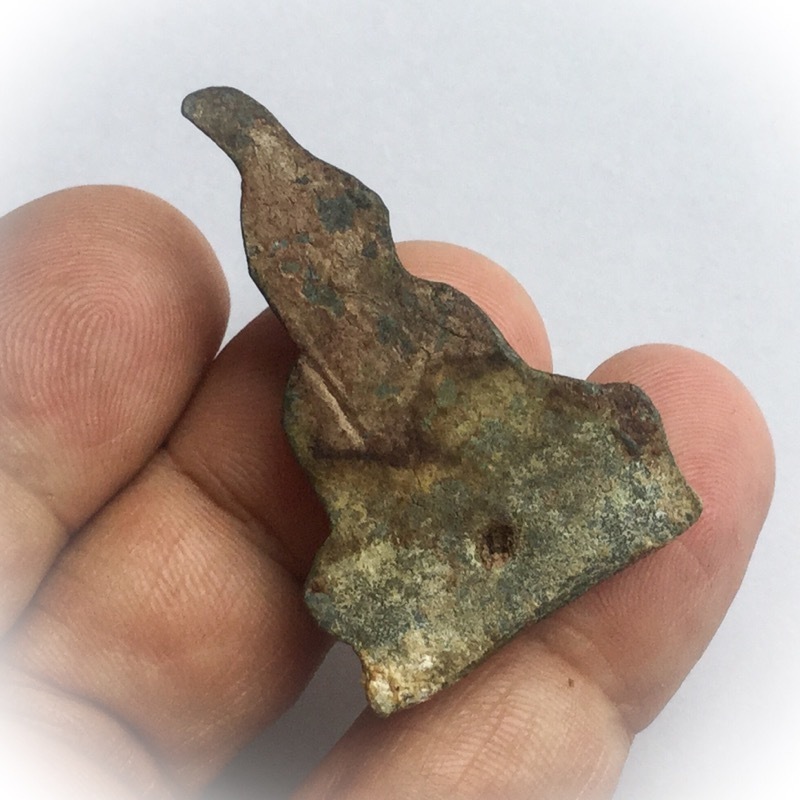 The Pra Kru Ta Gradan Sri Sawad amulet was discovered when the Kru hiding place broke open at the enpty delapidated temple in Sri Sawad district in the year 2460 BE. 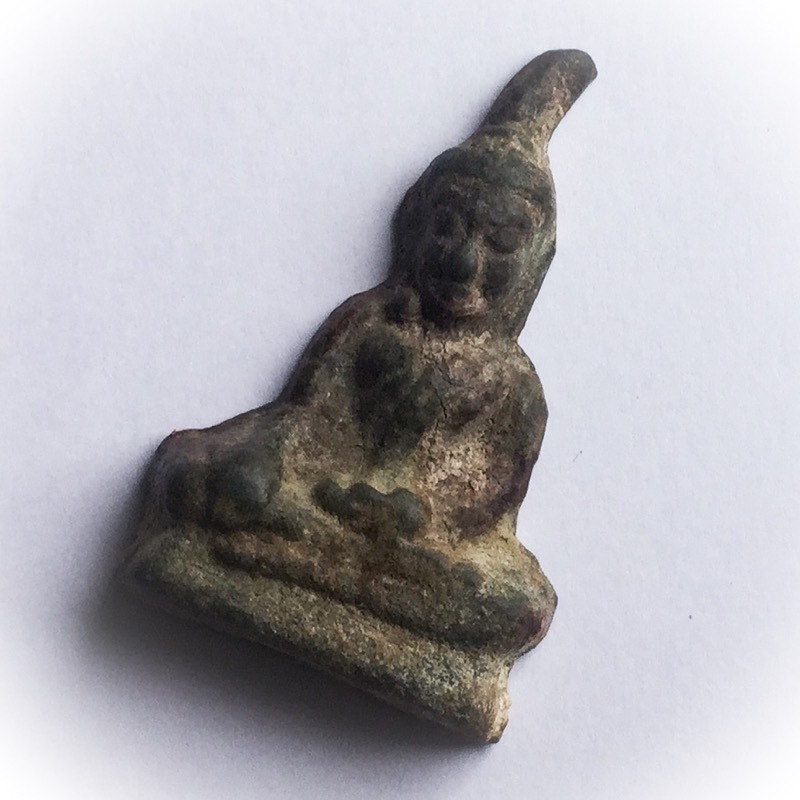 The first amulet was found at Wat Klang, then more turned up at Wat Nuea, and at Wat Tai. The Pra Kru Ta Gradan is honed in the image of a Lersi hermit sitting in Meditation, with a bound topknot. found in two different 'Pim' (models); Pim Gaes Yaw (long topknot), and Pim Gaes Dtum (short stumpy topknot). Both models have a flat rear face. On the 'Pim Gaes Yaw' longer haired model, the topknot of the bound hair of the hermit will bend to one side in one direction or the other. On the Pim Gaes Dtum, there is only a small stump pointing upwards. It is believed that it was Ruesi Ta Fai who made the Pra Ta Gradan amulet which he invited the Lord and Ruler of Ta Gradan City. Once they had made the amulets, they were buried in Gru hiding place chambers in various important sacred places around Kanjanaburi, Ta Gradan and Sri Sawat areas. It is also called Pra Gaes Pid Ta Daeng (meaning ' with topknot and closed red eyes - as in 'Ngang Ta Daeng'), meaning 'red eyes', for the red rust on the leaden surface which gives a reddish glint to the amulets face. the topknot of the image, which is in meditation posture, is long and wound up in a high bundle, like that of a Lersi. The face is typically that of a Lersi. The Lersi would never cut their heair, which is why the image has a long bound topknot rising up from the head. The Ta Gradan amulet is one of the Ancient members of the Traipakee family of amulets, and a powerful wielder of Kong Grapan, Maha Amnaj, Maha Ud, and Klaew Klaad magic for invincibility and safety, evasion of dangers and obstacles. 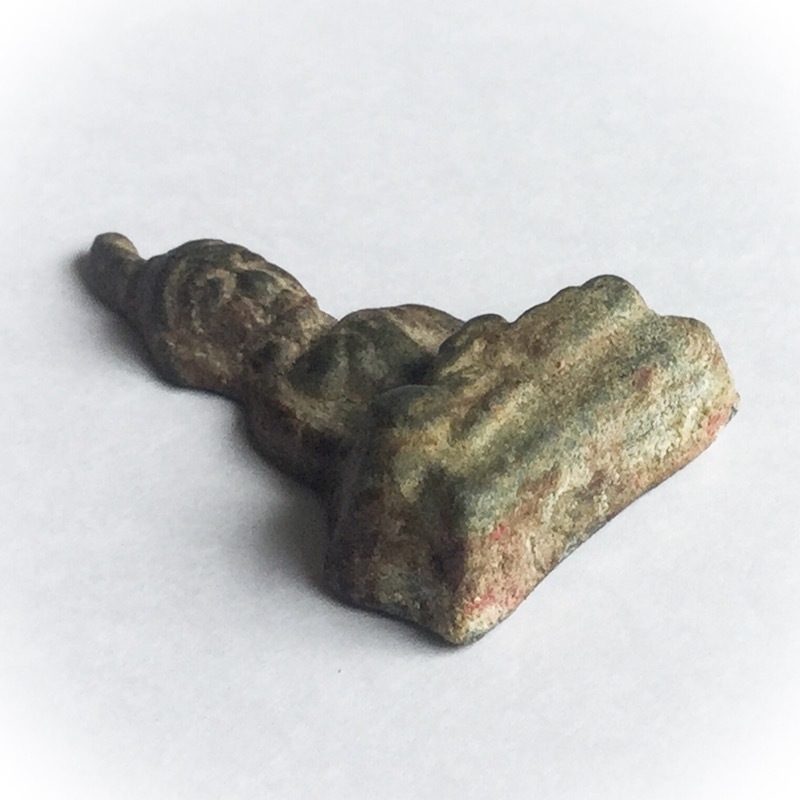 A Yorn Yuk Nostalgia Piece of an Ancient Masterpiece of Historical Sacred Art, in addition to being a truly Powerful Authentic Amulet of Importance in its own right, for it has reached the respectable age of one Century. The 'Khai Khaw' white 'froth' and 'Sanim Daeng' red 'rust', are clearly visible to appear as 'Roi Raberd' (explosion marks). This is most visible when perusing the surface of the rear face of the amulet. However, they are not as deep and thickly coated as we see in the case of the first hiding place find, which reveals at least another couple of centuries of burial. This is most probably a later edition made sometime during the last Century,Truly Aged 'Nuea Chin Dtakua' (silver-leaden alchemical alloy), does not have 'Kraap Gru' (residue) pasted onto the surface. 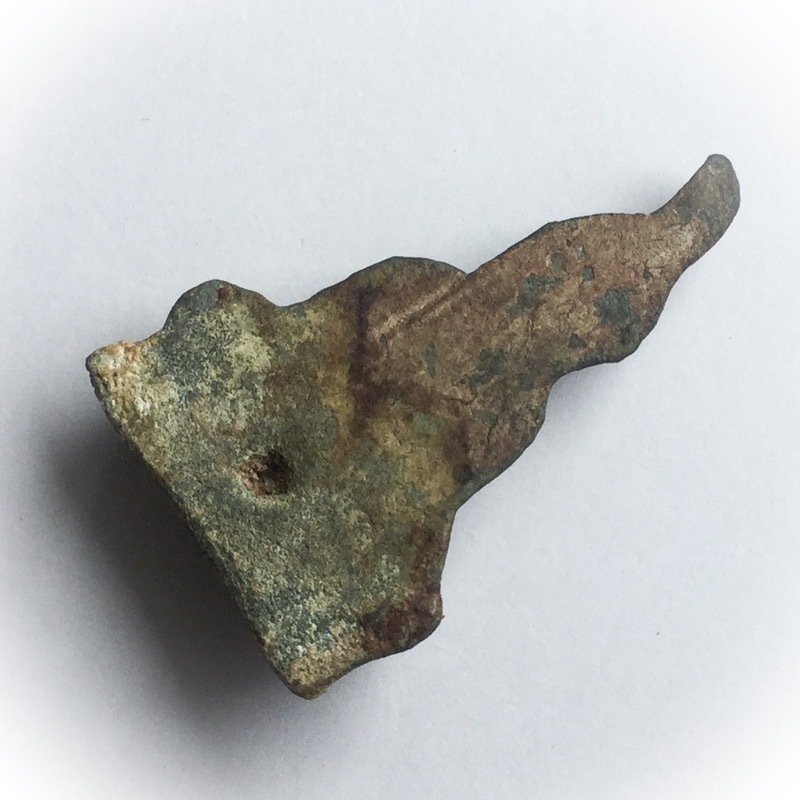 Really Ancient 'Kraap Gru' (residue stains) of 'Pra Nuea Chin Dtakua (leaden amulets), appears through the process of the residues rising up from within the amulet, and breaking through the surface. The thicker the residue (Kraap Gru), the more likely the amulet is much older. Thin layers of Kraap Gru Khai Khaw (white froth residue) as opposed to thick layers, mean less aged. Areas of reddish rusty residue are visible called 'Sanim Daeng', meaning 'red rust'. This reddish stain is in some areas to be perceived as having a maroon/brownish tint to it. The Pra Kru Ta Gradan is one of the red rust category of 'Pra Nuea Chin' (leaden amulets), and is through this classification and its Trai Pakee status, worthy of the title 'Pra Yord Niyom Nuea Chin Sanim Daeng' (Buddha Amulet of the Highest Preferred Class of the red rust leaden amulet category). 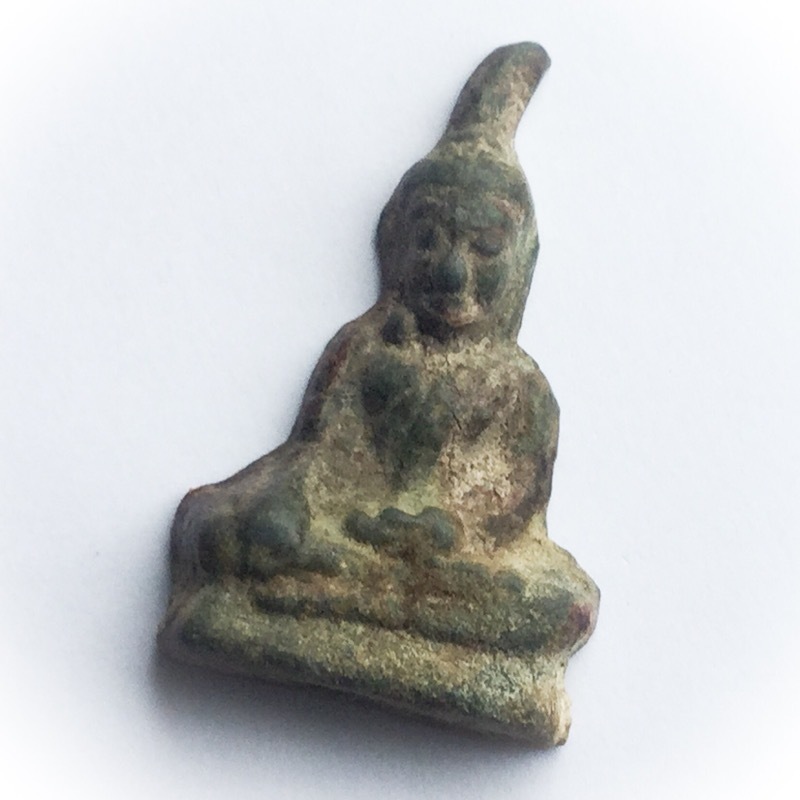 There are various categories of 'Pra Nuea Chin' (leaden amulets), including 'Khai Khaw' (white froth), 'Sanim daeng' (red rust) and 'Sanim Khiaw' (green rust). One of the recognition factors which elevate the Pra Ta Gradan Nuea Chin Dtakua Sanim Daeng from the first hiding place find at Wat Klang, is the fact that those amulets were placed into their burial place with gold leaf pasting, which then flaked into dust and mixed itself into the Khai Khaw froth of the Kraap residue which rose up through the interior of the amulets to form a covering over the amulets. In the finest and most highly prized models, this gold dust is visible within the white froth lending a brown sugar kind of look to the surface residue, with a golden brown yellowy color, interspersed by the snowy white fine powdery Khai Khaw residue. 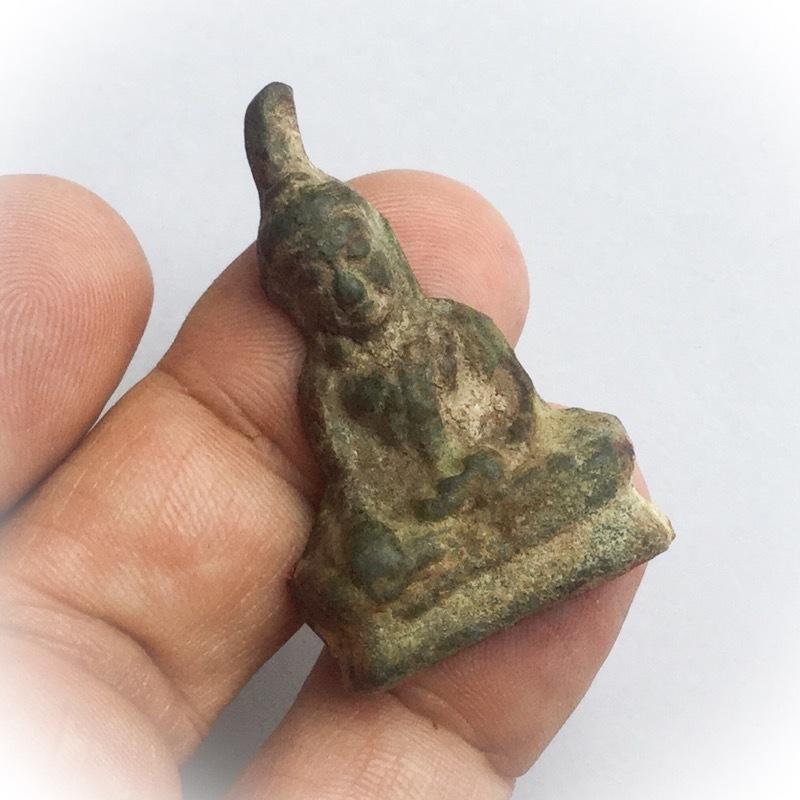 This amulet is therefore a Classic Ancient Amulet, of Authenticity and High Esteem, with true Kong Grapan Chadtri Klaew Klaad Maha Ud Maha Amnaj Powers, but for reasons of it coming from a later Era than the first find at Wat Klang, is a much more affordable alternative to the Pra Kru Ta Gradan from the Wat Klang Find. With amulets of this age and classification, it is mostly never known who made them, or exactly when the amulets were made by. But what we do know about Ancient Amulets of this kind, is that all amulets of those Eras were given the most Sacred and Highly Powerful Blessings and Empowerments, and were made from Truly Sacred Artifacts and Sorcerous Substances, in a time when Buddhist Amulets were not yet commercialised in any fashion, and where their only purpose of creation, was to serve humans and lessen sufferings, protect and increase happiness. In those days, hundreds of Monks and Lersi would attend the empowerment of amulets, which were made in truly ancient and sacred methods. This amulet is an excellent amulet for those who seek a lower priced entry stage into collecting Great Classics, without breaking the bank to do so. If competing in competitions and prize winning is not your aim, rather, you seek a truly Sacred Amulet of decent age, for protection, then this amulet is a highly recommendable choice. If what you seek is a competition grade model, then one wold have to enter into a much higher price entry level to begin competing, and this amulet would not be the recommendable choice. In short, this amulet is an Authentic Sacred Amulet Highly Worthy of Bucha, but not necessarily a Recommendable Showpiece to Hope to Brag with in National Competitions, which is the only reason why this amulet is still highly affordable. 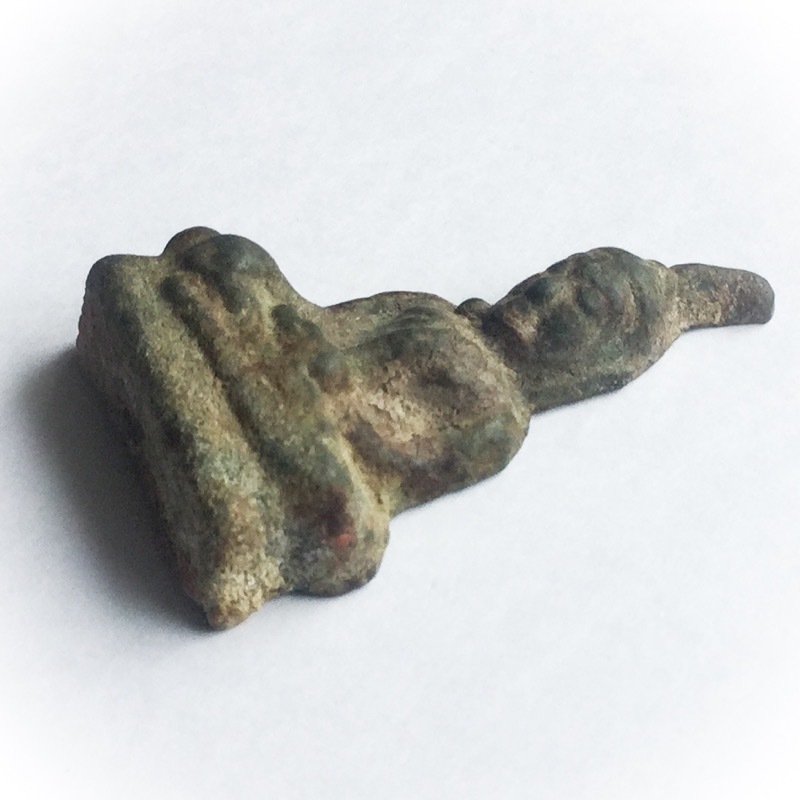 Leaden amulets are amongst the rarest amulets to find, and are mostly highly priced. This sacred Leaden Amulet is of a much Higher sacred Value than its price tag reveals, and is a most recomendable choice for those Devotees who seek an Ancient Sacred Amulet of High Buddhakhun power, for protection, increased status, and auspicious blessings.